Life in this modern age is characterized by high levels of stress and strain arising due to extremely hectic schedules and innumerable challenges on a daily basis. As a result of this, a large number of lifestyle diseases have popped up in recent times and are compelling people to be more attentive towards their health. With men and women gradually becoming more and more health conscious, it is really important to settle for the right combination of diet and exercise in order to achieve those fitness goals. Today we have reviewed Nautilus E614 Elliptical machine which looks like the best elliptical machine available in market as of now. Most people find it quite difficult to hit the gym regularly since there is hardly any time left for themselves after juggling responsibilities at the workplace as well as home. It makes much more sense to exercise at home whenever you find it convenient. Owning a fitness equipment will save you from the worries of having to step out at an hour when you are really tired, and do not feel like it. So, getting hold of an ideal exercising machine is the key to remain fit and active. Amongst other fitness equipment, elliptical machines have become tremendously popular in gyms these days. The huge demand for elliptical machines have automatically led to their easy availability in all the shops dealing in fitness equipment. The latest elliptical machines are equipped with cross ramp technology which facilitates the work out of different groups of muscles in the body. The angle of inclination of the ramp can be adjusted with the help of handle bars to target different problem areas which require rigorous exercise for toning. Nautilus E614 Elliptical happens to be one of the bestselling elliptical machines till date, for its range of features and excellent durability. Nautilus E614 Elliptical is a fitness equipment that boasts of 22 different workout programs with each one them focusing on a particular aspect of fitness. This machine comes with a Dual Track LCD window with the help you which you can easily keep a tab on your rate of progress. And you also have the option of reading your favorite stuff to kick out monotony during your work out. Has an inbuilt charging session for devices and is capable of transferring data. Nautilus E614 Elliptical machine is reliable and ideal for use by the entire family. The moment you start hunting for a fitness equipment that is qualitatively superior, lasts for years yet does not burn a hole in your pocket, Nautilus E614 Elliptical should be the very first name to pop up in your mind. Investing in a good exercising equipment is indeed a practical and wise decision that is sure to reward you in the long run. Nautilus E614 Elliptical has features that make it ideal for both personal, as well as commercial use. This big, sturdy machine is fitted with wheels that aid in relocation. You can simply enjoy your favorite music playing loud and clear on its acoustic chambered speakers while you keep track of your pulse rate too. After delivery of this machine, all you need to do is to assemble the parts carefully, and you will soon be ready to chase your fitness targets with fullest gusto. The best part about elliptical machines is the concept of adjustable ramp along with moveable handlebars which ensure the safety and comfort of all users, irrespective of age, body weight or levels of fitness. The electronic readouts immensely help in monitoring progress. To top it all, Nautilus E614 Elliptical comes with a powerful cooling fan that will fetch you relief during those sweaty moments. Recommended Reads: How Does an Elliptical and StairMaster Machine Differ? 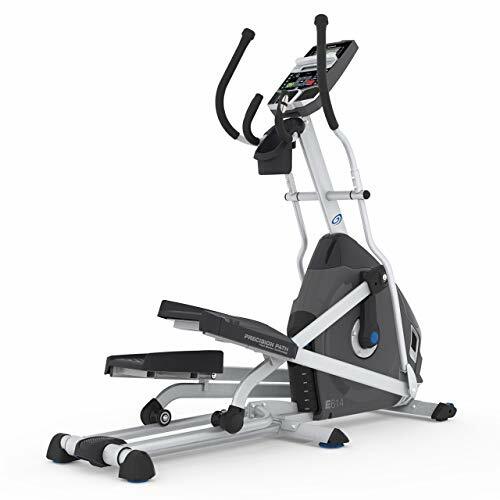 The Nautilus E614 Elliptical is the perfect choice. This elliptical features a DualTrack™ display with two LCD monitors that display time, distance, and calories in different areas so you can view your favorite entertainment while keeping track of your workout.